From left to right: Ntobego Peni, Linda Biehl, Manfred Jacobs and Don Marsh in the St. Louis Public Radio talk studio on April 23, 2014. 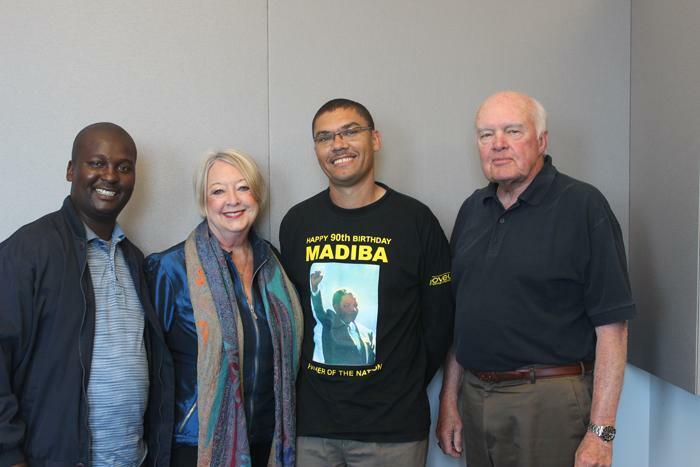 A discussion with South African corrections officer Manfred Jacobs, Linda Biehl, and one of the South Africans who was convicted of her daughter’s death in 1993 about their reconciliation work. On that day, the group was out in force to disrupt the government of the township. At the time, Nelson Mandela had been freed, but the multi-racial elections that would put his political party (the ANC) in power had not yet taken place. “Amy’s car happened to drive behind a truck that was delivering drinks … Someone screamed ‘Here’s a settler,’ … and our slogan for the operation was ‘one settler one bullet,’” said Peni. While their motivation in taking to the streets was not kill, “we were prepared to die for the cause, and in the process of that, we automatically became prepared to kill for it,” he said. Peni first learned about Amy’s stance against apartheid in the trial, but believed it to be propaganda. It wasn’t until he met Amy’s parents as part of the new government’s Truth and Reconciliation Commission that he realized it could be true. Rather than demanding retribution, Peter and Linda Biehl said it was not up to them as Americans to decide whether Peni should be forgiven. Instead, it should be decided by South Africans. The Truth and Reconciliation Commission was set up to allow political criminals to state their case and have the opportunity to be granted amnesty if their actions were proven politically motivated. During the amnesty hearing for the four men convicted of killing her daughter, Linda Biehl described Amy as a gymnast and a diver. “And all of a sudden, the four guys, who were sitting up there with their heads down, looked up. They realized Amy was a human being,” she said. Four and a half years after Peni entered prison, he was granted amnesty and released. He and Easy Nofemela, one of the other four men convicted of Amy’s death, reached out to the Biehls and asked if they could get involved with the foundation the Biehls had started in Amy’s name. Today, Peni and Nofemela run the South African branch of the foundation, which runs youth programs in the Western Cape with a mission of empowering youth and promoting reconciliation. “Ntobego and Easy stepped out of their comfort zone to say ‘hey, the Biehls are over here doing some stuff, we’re trying to peacefully change our community’—how could we not?” said Linda Biehl, explaining why she and her husband accepted Peni and Nofemela’s help. To her, the court trial and amnesty hearing allowed justice to take place, and what she wanted to focus on was the healing of a country long divided by apartheid. Linda Biehl and Ntobeko Peni are in St. Louis for a panel discussion on Nelson Mandela’s legacy of reconciliation presented by Maryville University. Manfred Jacobs, a correctional officer at Drakenstein Correctional Services in Western Cape, South Africa is also part of the panel. He works at the prison that held both Nelson Mandela and Ntobeko Peni, although he didn’t start working there until after Mandela was released. The prison Jacobs works at has modeled skill development programs after the programs of the Amy Biehl Foundation. Inmates teach youth from poor neighborhoods skills such as welding to help promote self-worth. The Amy Biehl Foundation carries on the peacemaking and service work of Amy Biehl in South Africa and the United States. Recently the U.S. branch of the foundation has partnered with Whittier College to develop a high school curriculum centered on human rights. Maryville University Presents “Nelson Mandela’s Legacy of Reconciliation: Lessons for Leading an Inclusive Community"
For more information, visit the Maryville University website.